If it’s time to replace your old mattress, you should think about switching to the Purple brand. 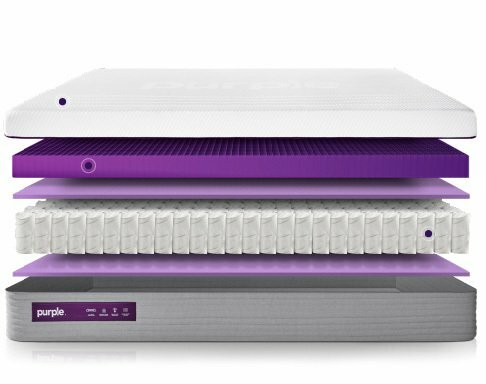 Known for its unique mattresses, Purple is becoming one of the most popular online sleep companies. In this guide, we’ll discuss the different types of mattresses they sell as well as Purple mattress reviews. Purple was founded in 2015 by two brothers, Tony and Terry Pearce. At the time, the brothers were new to the mattress industry, but they were well-versed in inventing cushions. Before starting Purple, Tony was a rocket scientist who specialized in designing aerospace materials and Terry worked in manufacturing, design, and project management. One day, the brothers took an interest in the cushioning industry. Their first task was to design a more comfortable wheelchair seat pad. The brother’s solution was Floam™. Since the invention of Floam™— which is now found in medical beds, footwear, medical braces, golf bags, seat cushions, and much more— the Pearce brothers have patented over 30 cushioning technologies. In 2013, with their expansive knowledge and variety of patents, the Pearce brothers decided to invent their own mattress. Their mattresses are unique from most other brands because they contain their patented Smart Comfort Grid™ made from hyper-elastic polymer. In 2013, they invented the Mattress Max, a machine that allowed them to create and mold pieces of elastic polymer into mattresses. With the birth of the Mattress Max, these two brothers began designing the world’s first no-pressure mattress. In 2015, the Purple Kickstarter campaign launched. Five days later, the Pearce brothers had brought in $25,000, meeting their campaign goals. As their mattress became more successful, Purple grew. In 2017, the Pearce brothers sold the company for $1.1 billion to Global Partner Acquisition Corporation. Today, Purple is headquartered in Alpine, Utah where they have a showroom that customers can visit. For the first year or so, their mattresses were sold exclusively on their website. Now, their mattresses are sold in Mattress Firm, Macy’s, and Bed, Bath and Beyond locations nationwide; they’re also manufactured right here in the United States. At first, they sold only their original mattress. However, as they became more popular, they started selling other sleep accessories such as sheets, blankets, mattress protectors, pillows, and foundations. They even sell dog beds and seat cushions. In the next section, we’ll be discussing the mattresses Purple carries as well as the materials inside. When they first launched, they sold only one mattress— the Original Purple. Now, they’ve introduced three other hybrid models containing both their Smart Comfort Grid™ and an innerspring coil system. It goes without saying, the Smart Comfort Grid™ is a grid-shaped layer; this grid is designed to relieve pressure and tension while you sleep. It relaxes under pressure points such as your shoulders and hips while providing enough support to maintain your body’s natural shape. The hyper-elastic polymer should prevent motion from transferring throughout the bed, meaning it’s a good option for couples. Additionally, the grid-shape of this layer allows for air to flow through the mattress, so this mattress shouldn’t sleep hot. All of their beds are CertiPUR-US® certified, meaning their mattresses are free from ozone depleters, heavy metals, mercury, lead, formaldehyde, phthalates, and are low on VOCs. The original model was made with three layers: two layers of poly-foam and the Smart Comfort Grid™. As previously mentioned, the Smart Comfort Grid™ relieves pressure points and cushions your body. Below the grid layer is the first layer of soft poly-foam; this layer supports the grid above by contouring to your body and providing soft comfort. The poly-foam layer below is made from high-density, medium-firm foam; this layer is the base of the mattress. The purpose of the base of the mattress is to provide structural support for the layers and sleeper above. They rank this mattress a 6.5 out of 10, or medium-firm, in regards to firmness. Because it’s designed for universal comfort, they recommend this mattress for back, stomach, and side sleepers. Their new hybrid mattress comes in three different models, the Purple.2, Purple.3, and Purple.4. These mattresses have the same composition, the only difference between the models is the height of the Smart Comfort Grid™. For example, the Purple.2 has 2 inches of the Smart Comfort Grid™ while the Purple.3 has 3 inches. Though this change may seem small, it changes the overall feel of the mattress. The Purple.2 is their firm model, the Purple.3 is medium, and Purple.4 is soft; this means, the Purple.2 is better for back and stomach sleepers while the other two models are more geared towards side sleepers. First, comes the Comfort Smart Grid™, put in place to relieve pressure points and provide comfort. The first layer below the Smart Comfort Grid™ is a layer of soft poly-foam; this layer reinforces the grid above by cushioning your body while you sleep, it also acts as a cushion between the grid and the coils below. Next, comes the pocketed coil layer, pocketed coils provide great pressure relief and motion isolation because they move independently of one another. Typically, hybrid mattresses are more expensive than mattresses without coil systems. Because coil systems are durable and designed to last, adding a coil system to your mattress should increase its lifespan; you should get more years out of a hybrid mattress than mattresses made from other materials. Last, comes the core of the mattress made from a thin layer of durable poly-foam, and mesh-based side panels for added edge support. For this article, we’ll be basing our prices on Queen sizes. For the best deal, keep tabs on the Purple website. They regularly run mattress sales, so waiting to buy could save you a couple of hundred dollars. The price of the Original Purple mattress is $999. The price of the Purple.4 is $2,799. When you buy a Purple mattress, it comes with a 100-night sleep trial. The sleep trial is great for customers who buy online, as they don’t get a chance to try the bed before buying. During your sleep trial, you’re given the chance to try the bed risk-free. Meaning, if you decide it’s not the best mattress for you, you have the option to return or exchange it. In the event of a return, Purple would issue you a full refund. If you decide to exchange, your new mattress would come with another 100-night sleep trial, but it’s important to mention Purple only allows one exchange. Should you decide to return or exchange your bed, Purple will arrange for the unwanted mattress to be picked up from your home and either recycled or donated locally. They do not charge a fee for this pickup service. After you purchase your new mattress, it is backed by a 10-year warranty. If your mattress develops an indentation greater than 1-inch or the materials of the mattress crack or split as a result of normal wear and tear, Purple will repair or replace it. The cover of the mattress is only covered for 2 years after the purchase date; if there are any faults in workmanship resulting in defects in your cover, they’ll send you a new one or repair the cover you already have. If Purple decides to repair your mattress or cover, you would be responsible for sending it back to them, that means covering any shipping or transportation fees. Should Purple issue you a new mattress during your warranty period, the replacement will be covered for the remainder of your original warranty. 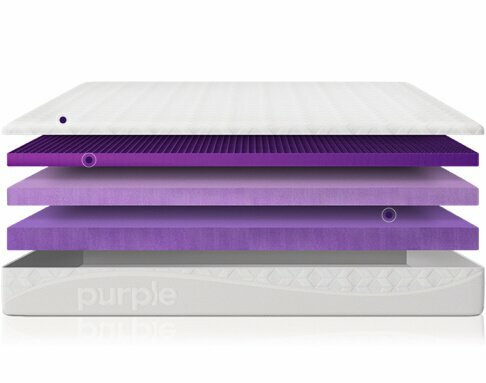 Whether you’re a back, stomach, or side sleeper, Purple has a mattress to meet your sleep needs. There is no mattress quite like Purple in the market, as no other mattress contains a hyper-elastic grid system. The unique grid system is what gives Purple its distinctive pressure relieving abilities. Customer reviews mention their mattresses sleep exceptionally cool and are both conforming and pain-relieving. Their new hybrid models have been regarded as some of the best, and most budget-friendly hybrid mattresses in the market right now. If you’re not so sure a Purple mattress is right for you, check out our other mattress reviews to decide which bed is best.